An estimators main role within the construction industry is to work with designers and engineers to plan the exact raw materials needed to complete a project. This is usually a long list covering every element of construction. Another aspect of estimating for a project is the labour cost. Many contractors and sub-contractors will be needed for different elements of the project and the estimator will have to calculate how long the project will last to ensure everything is taken into account. To calculate the total cost and duration of a project. Researching the market to identify all the necessary costs involved, such as materials, labour, equipment costs etc, comparing quotes by different contractors and suppliers to get best value for money, preparing and submitting quotations and making sure the different stages of the project are progressing to schedule and the costs are kept to within the budget. Someone considering Estimator Jobs Northern Ireland should ideally have the following: Excellent numeracy skills, The ability to work under pressure and to timescales, Good communication skills, Excellent knowledge of construction industry for sourcing labour and materials. • Or a HNC / HND / Degree in Quantity Surveying / Construction Management / Civil Engineering (including an industrial placement). Plus a minimum of three years experience of managing elements of construction projects. The job of estimator within a company is a vital one and involves a certain amount of pressure as miscalculations can lead to a lot of additional costs. Any company behind a project will expect the Estimator to work out the best deal available. The estimator will mostly be based in an office however they may also have to visit sites and companies putting forward bids and quotes for projects. An estimator would normally have a relatively standard working week, although overtime can sometimes be necessary when a deadline is looming. For anyone considering an estimators job it would be helpful to have some sort of background in the construction industry. 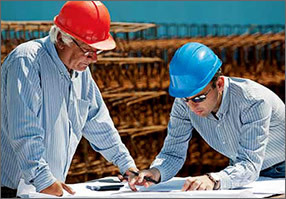 Relevant trades could include electricians, roof layers, carpenters and construction workers. So if you feel an estimators job could be the career for you, we at CSRNI can help with our available Estimator Jobs Northern Ireland.